MANY were positively surprised by the Sunway group’s intention to spin off its construction arm, Sunway Construction Sdn Bhd (SunCon), with a view to relisting it by next year as Sunway Construction Group Bhd (SCG). Nevertheless, some question whether the exercise, which will mainly raise funds for shareholders via a share sale, would leave SunCon without an adequate war chest for expansion given its almost full capacity. The group says this is not the case as there is no immediate need for fresh funds at SunCon. To recap, on Sept 19, Sunway Bhd announced that it intends to list SCG as part of a broader reorganisation of the group. This will result in SCG becoming a pure construction player, while the group will retain other non-construction assets that are currently held by SunCon. While Sunway’s current shareholders will be generously rewarded via a cash dividend as well as shares of the relisted entity, SCG would not be able to use most of its own initial public offering (IPO) proceeds to expand its operations. Sunway has indicated that the allocation of proceeds from the IPO for SCG’s working capital purposes will be limited. Some say that this could mean SCG would have to undertake another round of fundraising as its capacity is set to be fully utilised by the end of the year. At present, SunCon is aggressively bidding for new projects and expects its order book to grow by RM2.5 billion by the end of this year. With SunCon’s current RM3.4 billion order book, the additional RM2.5 billion would bring it to full capacity, according to a Sept 22 note by AmResearch. While this translates into a clear earnings visibility spanning the next few years, it also means that the company would not have the scope to take on new projects starting next year until it undertakes a capacity expansion via internal funds or a fresh fundraising exercise. In a reply to The Edge, a high-ranking official of Sunway reiterates that the listing will be beneficial to its shareholders and SCG, and that there is no immediate need for the latter to seek fresh funds. “From the structure of the offering, which is via an offer for sale of existing shares rather than an initial offering of new shares, it is notable that SunCon is actually not raising funds from this exercise. This is because it has adequate working capital to carry out its operations as usual,” he says. The official adds that the exercise represents the culmination of a decade of success by SunCon, which has emerged as a top construction player with a strong backer as well as access to a multitude of new projects, particularly those initiated for its parent company. “SunCon was taken private in 2004 and now it will go for relisting in 2015. Over the past decade, the company has proved itself as one of the leading construction companies in the country. The proposed listing exercise will help to unlock the value of SunCon and a large part of the benefits will be distributed to the shareholders of Sunway,” he says. Taken private at a cost of RM221 million back in 2004, the relisting of SunCon could fetch a valuation of close to RM1.5 billion, representing a fivefold return on investment over 10 years for the group. As a listed entity, SCG’s share base will total some 1.29 billion, with Sunway retaining a minimum 51% controlling stake. Based on Sunway’s 55.65% in SunCon, the listing would entitle it to 719.5 million shares. The remaining 573.4 million shares will be part of the IPO, of which 401 million shares are set to be offered to retail and institutional investors while the rest will be distributed to Sunway’s existing shareholders, based on an entitlement of one SCG share for every 10 Sunway shares. Additionally, those who own Sunway shares are entitled to a potential cash dividend of up to 30 sen per share, which will come from the gross proceeds raised in the IPO. Largely buoyed by its healthy order book, SunCon’s earnings are expected to improve significantly over the next several years, which could imply a premium valuation when it goes for listing as SCG. From a net profit of RM59.5 million in FY2013, AmResearch projects SunCon’s earnings to grow to as much as RM112.4 million by FY2016. RM990.38 million respectively. The company reported retained earnings of RM773.72 million last year. Total liabilities amounted to RM870.06 million, of which RM816 million was current liabilities. However, the official points out that SunCon’s gearing remains minimal at present and post-listing, and that the figure is representative of a construction company. “With the listing, SunCon, being an established construction player in Malaysia, will be able to gain greater visibility and recognition in its own right, based on its proven track record. 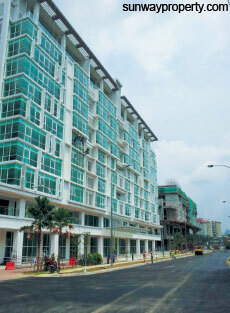 It will no longer be overshadowed by its parent, Sunway,” he says. In spite of the assurances, a question mark remains as to what the future holds for SCG. While an order book of RM6 billion would guarantee steady earnings, having a full capacity may prevent it from undertaking new and potentially highly lucrative construction jobs, particularly with the mass rapid transit Line 2 project looming on the horizon. The company could also potentially be overtaken by its peers which are able to employ greater leverage to undertake capacity expansions. As it stands, SCG’s listing prospectus will reveal its true financial health and whether it has enough capital to grow its business without relying on the IPO proceeds. This article first appeared in The Edge Malaysia Weekly, on October 06 - 12, 2014.